Frequency: The train leaves every 5 – 15 minutes. 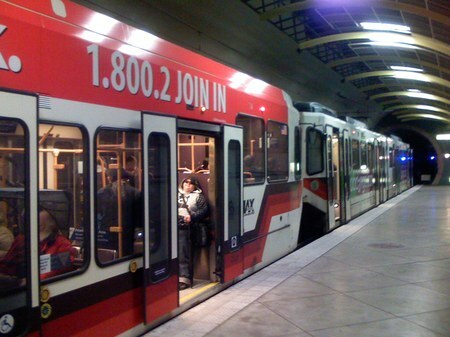 Next train: Text 8384 to 27299 to get a text telling when next MAX train is due. 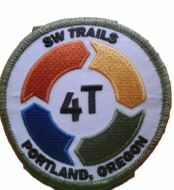 Trail head: Directions to Downtown train stop. at SW 10th and Morrison. Tickets: If you don’t already have a valid TriMet ticket, you’ll need to purchase one from a ticket terminal before boarding MAX. Adult tickets are good for 2 1/2 hours and cost $2.50 ($1.25 for youths and $1.25 for seniors) . All day tickets cost twice as much. TriMet tickets, while valid, are good for use on both the Train, Trolley, and Bus. Restrooms: At Central Library at start of trip and Zoo at end of trip. Pets: Unless its a service animal, your pet must be kept in a carrier. The trip from Portland downtown to the Oregon Zoo is accomplished by riding the train (MAX). Board at the MAX Galleria Station at SW 10th and Morrison. Be sure to purchase and validate your ticket at the ticket kiosk prior to boarding, or your Trimet trolley ticket can be used if the time has not expired. Be sure you are taking a train to Beaverton or Hillsboro. Get off the train at the Washington Park Station, Oregon Zoo station 4 stops from where you get on. TriMet’s MAX Light Rail train system connects Portland with Gresham, Beaverton, Hillsboro, Portland International Airport and Clackamas. From downtown Portland, the train takes you into the 3-mile-long Robertson Tunnel. 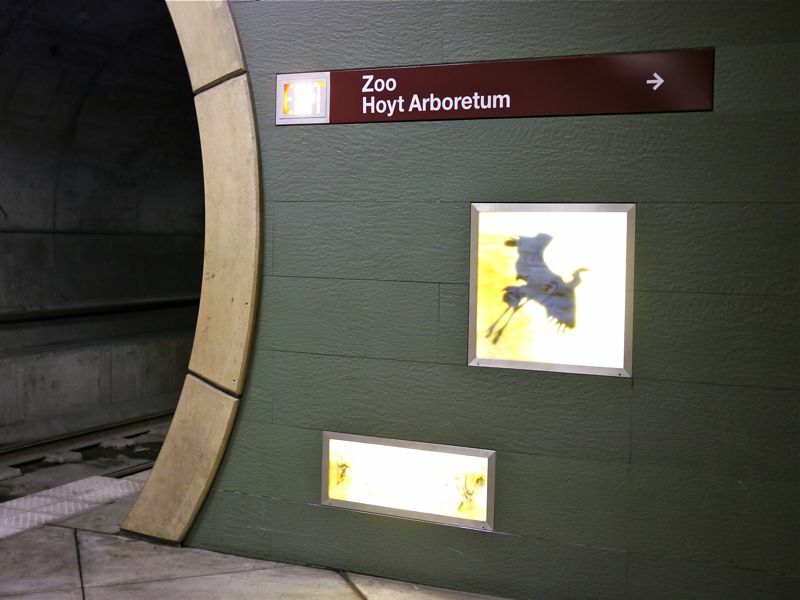 At 260 feet below ground, the MAX’s Washington Park station (at the Oregon Zoo) is the only completely underground station in the MAX system. It is the deepest station in North America and second deepest in the world (after Moscow’s Park Pobedy at 318 ft). Core sample showing geological timeline in Zoo train station. Before leaving the underground station you might want to look around at the inscriptions on the walls. Amongst other decorations you will see a complete core sample showing the layers of earth above you and the time line when these layers where created. To the elevator to the Zoo on the surface above the train station. To exit the train station look for the elevators to the Zoo. In the elevator you can watch the elevation change as you go up.